L. buschianum Lodd. (L. pulchellum Fisch.). Siberia (eastern regions), norttheasten Mongolia and China. Steppe and meadows, hill slopes. Bulbiferous plant 30-50 cm. Bulb elongate-ovate, 4 cm diam. Flowering shoot with lanceolate leaves 5-10 cm x 0.5 cm. Flowers 3-4 (5) cm diam., broadly campanulate, ascending, orange-red with minute dark spots. V - mid spring to early autumn, in St. Petersburg May to September. Fl - June-July. Fr - August-September. Moderately light-loving but endures slight shade. Propagation by bulbs and seed. Short-lived plant (5-7 years). Introduced into cultivation by St. Petersburg Botanical Garden in 1740. Z 4. Far East (southern Primorskiy Region), northeastern China and Korea. On stony and grassy slopes, rarely among shrubs. Bulbiferous plant 50-70 cm. Bulb ovate-elongate, 3 cm diam. Flowering shoot leafy. Leaves narrow linear, to 10 cm. Flowers 2-15, 5 cm diam., lilac, slightly spotted, tiariform. White-flowered forms also exist. V - May to September. Fl - July. Fr - August-September. 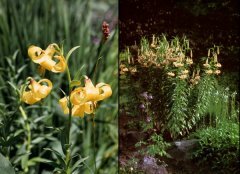 Plant in sunny places on well-drained soil. P - by seed and division. Flowers 1-2 years after sowing. Introduced into cultivation by St. Petersburg Botanical Garden in 1910. Z 5 (4). Far East (southern regions), northeastern China, Korea. Among shrubs, in forests, often on wet places. Flowering stem cylindrical, 80-100 cm. Bulb rounded 3cm in diam. with numerous white scales. Leaves round-lanceolate, in whorl in mid part of stem and alternate and much less in size in its upper part. Flowers 2-10 per stem, 4-5 cm in diam., wide opened, orange-yellow with dark spottes. Pollen red-orange. V - mid spring to mid autumn. Fl - July, Augist. Fr - September, October. Grows well on lime free well-watered soil, in semishade places. P - by bulb scales in autumn and by seed. Rare in horticulture. Z 4. Caucasus (the Greater Caucasus, western part) and northwestern Turkey. From foot of the mountains up to subalpine zone, on forest edges, among shrubs, in meadows. Flowering stem up to 100-150(-200) cm. Bulb ovate, 8-10 (-25) cm diam., with many scales. Stem leaves lanceolate, 10-20 cm. Flowers 5-15, straw yellow, spotted inside, tubular campanulate (tips recurved), 6-8 cm diam., and 10-15 cm long. Pollen bright yellow or light brown. V - mid-spring to mid-autumn, in St. Petersburg and the Caucasus May to September. Fl - June (specimens from Abkhasia flower 20-25 days later) . Fr - August. Grows well on well-drained soil, in sunny places. P - by bulb scales and seed. Introduced into horticulture by St. Petersburg Botanical Garden in 1911. Z 4. Far East (southern Primorskiy Region), northeastern China, Japan and Korea. Meadows, rocky slopes, in river valleys. Flowering stem up to 100-150 cm, densely pubescent, leafy. Bulb globose, 3 cm diam. Leaves lanceolate, 10-19 cm x 2-3 cm. Flowers 3-25 in raceme. Each flower 8-13 cm diam., tiariform, brick red with brown spots. V - mid spring to mid autumn, in St Petersburg May to October. Fl - late summer, in St. Petersburg August. Fr - October. P - by seed, but more easily by the small bulbs originating in the leaf axils. Moderately light-loving, prefers rich soil. In cultivation in Europe since 1804. Z 4. Caucasus (Talysh) and northern Iran. Mid mountain zone, forest edges, grassy slopes at 1,500-2,000 m.
Flower stem up to 60-100 cm. Bulb ovate, 5-7 cm diam., with many scales. Stem leaves lanceolate, up to 10-12 cm, marginally pubescent. Flowers 1-5, white, tiariform, 4-6 cm diam. Anthers bright scarlet. Flowers with fragrant. V - mid-spring to early autumn, in St. Petersburg May to August. Fl - June-July. Fr - September. P - by bulb scales and seed. Prefers sunny places with good drainage, does not tolerate standing water. Extremely attractive. The gem of the genus. Z 5 (4). New. Caucasus (foothills of the Greater Caucasus, eastern part of the Lesser Caucasus). Edges of forest, grassy and shrubby slopes. Flower stem up to 50-100 cm. Bulb ovate, 5-8 cm diam., with many scales. Stem leaves numerous, alternate, lanceolate, 5-10 cm. Flowers 2-20, bright yellow, nodding, fragrant, tiariform, 6-7 cm diam. Anthers yellow or light orange. V - mid-spring to mid-autumn, in St. Petersburg May-September. Fl - June. Fr - August. P - by scales and seed. Prefers sunny places, partly shade tolerant. Introduced into horticulture by St. Petersburg Botanical Garden in 1800. Z 4. L. szovitsianum Fisch. et Ave-Lall. is closely related to this species. It differs in its bright red pollen grains and dense perianth segments. Cold resistant. Z 3. L. pensylvanicum Ker-Gawl. (L. dauricum Ker-Gawl.) Candlestick. Siberia, Far East (Kamchatka, Sakhalin, Kuril Islands), northwestern Mongolia, China, Korea and Japan. Forest edges, meadows, sea coastal sandy slopes. Flowering stem up to 30-100-(120) cm, ribbed, leafy. Bulb ovate, 3-4 cm diam. Leaves narrow, lanceolate, up to 10-12 cm x 0.5-1.5 cm. Flowers 1-5 in umbel or raceme, 8-15 cm diam., erect, usually orange brick red in colour. V- mid-spring to mid-autumn, in St. Petersburg May-September. Fl - June. Fr - August (not every year). P - by seed and daughter bulbs. Does well in sunny places, endures light shade. In cultivation since 1728. Z 3. L. pumilum Delile (L. tenuifolium Fisch. ex Schrenk), coral lily. Siberia (eastern regions), Far East, northern Mongolia, China and Korea. In steppe and on rocky slopes, on loam and sandy soil. Flowering stem leafy, up to 20-60 cm. Leaves linear, 5-10 cm x 1-2 cm broad. Flowers 1-20, tiariform, bright red, also white and orange, up to 5 cm diam., nodding. V - mid spring to mid autumn, in St. Petersburg May-September. Fl - June for 2-3 weeks. P - by seed and by scales, flowering 2-3 years after sowing. Tolerates partial shade. Short-lived plant (5-7 years). Introduced in 1728. Z 4.